Figure A. Alexa Fluor 488 conjugated Rat anti Mouse CD3 (MCA500A488) and Alexa Fluor 647 conjugated Rat IgG2a isotype control (MCA1212A647). 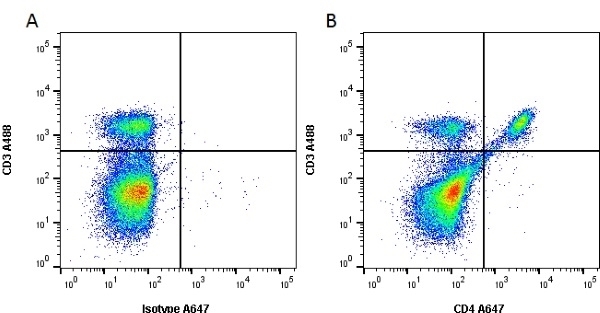 Figure B. Alexa Fluor 488 conjugated Mouse anti Human CD3 (MCA500A488) and Alexa Fluor 647 conjugated Rat anti Mouse CD4 (MCA2691A647). All experiments performed on red cell lysed mouse blood gated on lymphoid cells in the presence of 10% mouse serum. Data acquired on the ZE5™ Cell Analyzer. Figure A. RPE conjugated Rat anti Mouse CD3 (MCA500PE) and Alexa Fluor 647 conjugated Rat IgG2a isotype control (MCA1212A647). Figure B. RPE conjugated Rat anti Mouse CD3 (MCA500PE) and Alexa Fluor 647 conjugated Rat anti Mouse CD4 (MCA2691A647). All experiments performed on red cell lysed mouse blood gated on lymphocytes in the presence of mouse Seroblock (BUF041B). Data acquired on the ZE5™ Cell Analyzer. Figure A. Alexa Fluor 647 conjugated Rat anti Mouse CD3 (MCA500A647) and FITC conjugated Rat IgG2a isotype control (MCA1212F). 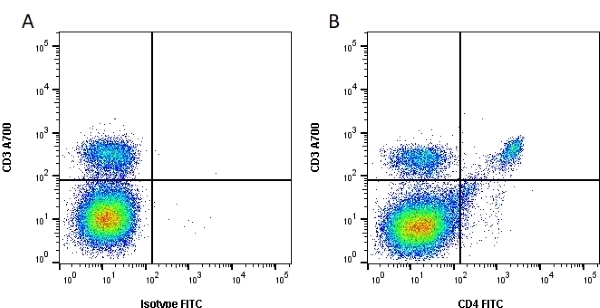 Figure B. Alexa Fluor 647 conjugated Rat anti Mouse CD3 (MCA500A647) and FITC conjugated Rat anti Mouse CD4 (MCA2691F). All experiments performed on red cell lysed murine splenocytes gated on lymphocytes in the presence of mouse seroblock (BUF041A). Rat anti Mouse CD4 antibody, clone RM4-5 detects mouse CD4, a 55 kDa protein also known as Ly-4 and L3T4. CD4 is a single chain transmembraneous glycoprotein which belongs to the immunoglobulin superfamily, and is primarily expressed on peripheral blood monocytes and tissue macrophages. CD4 is also expressed on a subpopulation of regulatory T cells (CD4+CD25+), which play a key role in the maintenance of self tolerance. Rat anti Mouse CD4 antibody, clone RM4-5 can be used for in vitro blocking of ligand binding, as well as in vitro CD4+ T cell depletions. Fehérvari, Z. & Sakaguchi, S. (2004) CD4+ Tregs and immune control. J Clin Invest. 114 (9): 1209-17. VonKutzleben, S. et al. (2017) Depletion of CD52-positive cells inhibits the development of central nervous system autoimmune disease, but deletes an immune-tolerance promoting CD8 T-cell population. Implications for secondary autoimmunity of alemtuzumab in multiple sclerosis.